George Biros is a Professor of Mechanical Engineering and holder of the W. A. "Tex" Moncrief, Jr. Simulation-Based Engineering Science Chair #2 and he leads the Parallel Algorithms for Data Analysis and Simulation Group in the Institute of Computational Engineering and Sciences. George earned his Ph.D. in Computational Science and Engineering from Carnegie Mellon University. He held a post-doctoral appointment at NYU's Courant Institute of Mathematical Sciences. 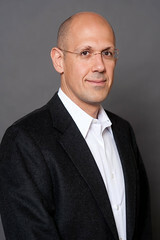 He has held faculty positions at the University of Pennsylvania and Georgia Institute of Technology. George's research group focuses on computational mathematics and the invention of new parallel algorithms for physics-based simulations and large scale data analysis. The group is developing technologies for discovery and innovation that will harness the upcoming breakthroughs in high performance computing, including exascale platforms. Current research topics include parallel algorithms, numerical algorithms for integral and differential equations, inverse problems, data assimilation, computational statistics, biological complex fluids, blood rheology, soft tissue and cardiovascular mechanics, and medical image analysis. Biros is a two-time winner of the Association for Computing Machinery's Gordon Bell Prize. In addition, he received an Early Career Young Investigator Award from the U.S. Department of Energy, and has authored numerous scientific publications. He is currently associate editor of the Society for Industrial and Applied Mathematics Journal on Scientific Computing.